These Casio diary models share a common set of functions and features, and a common data format and communications protocol. The SF-5x80 models were first introduced in 1996. They were discontinued in 1998. Different serial port interface operating at 12 volts instead of 6 volts, and cannot use the same cable as the SF-5x80 models. The difference is distinguished by a 3.5mm plug instead of a 2.5mm plug. New Synch function which allows the diary to synchronize with a PC database. The older Send/Receive function compatible with the SF-5x80 models is still present. The 3 separate files for the Telephone, Memo, ToDo, and Expense data types allow you to separate Personal and Business data, or other categories you may have. 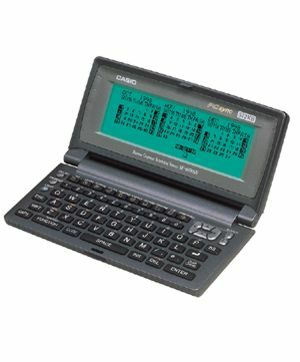 The password protection is a little different from other Casio diary models, protecting the entire diary contents rather than specific items. This is less flexible, but some people might prefer it. The password protection on Casio diary models is effective against anyone but a well-equipped digital electronics expert  there are no "back doors". All models have a display backlight for use in low light conditions, although it should only be used briefly since it drains the batteries quickly. You can customize certain settings, but there are no user-defined fields for any of the data types (i.e. like the "Free Fields" on older Casio models). 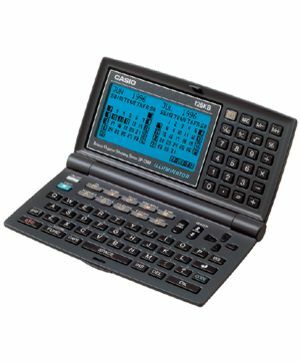 These models have a larger screen and keyboard than most pocket organizers, a boon for those with big fingers or weak eyes. The screen and keyboard on the later SF-6x00SY/7x00SY models is scrunched a bit though, even though the screen is wider, and they lack the separate calculator keypad. They use standard AAA or AA batteries for their main power, which are more readily available and less expensive than the small watch batteries used by other models. The AA batteries used by the SF-6x00SY/7x00SY models are the least expensive. All models also require a CR-2032 memory backup battery, which will need replacing every few years. All of these models have ample memory capacity for the average user, especially the SF-7x00SY models. Since Casio uses memory size as the main pricing factor, dont pay for more than you need. The Synch function of the SY models does allow true and efficient synchronization with a PC database. Unfortunately the protocol is supported only by Casios proprietary PC Sync program. The diarys Reset button allows you to restart the diary in case of an error without erasing all of the data. All of these models have the same key weakness: the date of Schedule items cannot be changed without deleting them and re-entering them. Everyone has to change the date of their Schedule items sometimes, so this is bound to be annoying. None of the other Casio models have this problem, so its surprising that Casio never corrected it on these models. These models are all big for a pocket organizer  too big and heavy to fit in most pockets in fact. If you really need the larger screen and keyboard, and you want to use inexpensive standard batteries, then the size is unavoidable. But most people would prefer something a little smaller and slimmer. The 255 character limit on entries with the SF-5x80 and SF-5x90SY models can make it difficult to transfer data from other diary models, all of which allow larger entries. The user interface is a little awkward. The key functions are not obvious, and many functions do not appear on the keyboard. While the Function menus provide many useful functions and options, there are still some key items missing. Other functions can be hard to find because the Function menu changes in different modes. Eventually you get used to it, but its difficult to learn for beginners. Youd think Casio would have learned some lessons from 10 years of experience with the previous SF models, but apparently not  these models are a little worse, if anything. How do these models stack up against other Casio diaries and other organizer models? You cant beat the SF-5x80/5x90SY models for a large screen and keyboard. If you have big fingers or weak eyes, they are a good choice. They have a few user interface flaws, but you can probably learn to put up with them. If you really want a wide screen, then the SF-6x00SY/7x00SY models have the widest screen around, but the character size and key size are a bit smaller than the SF-5x80/5x90SY models. If you are content to use Casios PC Sync program, the Synch function of the SY models works well to synchronize the diary with the PC. Dont expect to Synch with Microsoft Outlook or Lotus Organizer though. If you are buying one of the SF-6x00SY/7x00SY models, you will need a new serial cable for it. The "SYP" kits sold in the USA include the serial cable, but in other countries these models are sold without a cable. If you already have an older Casio serial cable and you dont want the extra expense of buying a new one, these models might not be the most cost-effective choice. These models are intended as basic organizers, i.e. for storing and managing Telephone lists and Schedule etc., and they are adequate for that purpose. 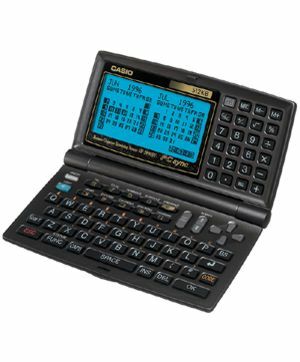 If you are looking for flexibility and programmability, you would probably be happier with a Palm PDA or one of the new Casio PVx models, albeit at a significantly higher cost. If you are looking for something small enough to slip into a pocket, these Casio models are not the best choice. You would probably prefer something like the inexpensive Casio SF-4985ER, or perhaps one of the Casio Pocket Viewer pen models.